My name is Riaan Smit. I am a Namibian-born, Cape Town based musician. While in Namibia to perform, myself and Luca Hart filmed an acoustic session outside Windhoek. After filming, we were attacked, assaulted and robbed by five men armed with large knives and rocks. Whilst trying to defend myself and my friends, I was stabbed in the arm and a rock was smashed into my face. Needless to say, I went down hard. My friends say they thought I was dead. The doctors tell me that had the strike been one centimeter higher, that would have been the case; and the end of my time here. Fortunately, it wasn’t, and as soon as the men had taken what they wanted and left, we rushed to the closest hospital. After keeping us face-down for what I am told was about forty five minutes, the attackers threw our car keys into a pile of garbage and fled. We gathered the cards the men had thrown to the ground and, once we had found the car keys, headed back to Windhoek as fast as we could go. I was covered in my blood, my friends were covered in my blood, and none of us knew how badly I had been injured. The doctors at Mediclinic Windhoek stabilized me and patched me up; and recommended I see a dentist as something was not right inside my mouth. Fortunately, one of the best dentists in Namibia is like family to me, and Dr Chavonnes Vrugt quickly confirmed the severity of my injuries with an x-ray. My upper jaw was badly broken, and there was a network of fractures in my face. The damage would need reconstructive surgery, and quickly. The nerve damage to my face made it impossible to blink, and eat - and speaking and drinking were an incredible challenge. As I write this, they still are. Dr Chavonnes Vrugt connected me with a friend of his operating in Cape Town, Dr Gerrit Wyma. I landed in Cape Town the day after the attack and Dr Wyma saw to me as soon as I arrived. After ascertaining the extent of my injuries, he decided that surgery must be done as soon as possible, and I was booked in on Wednesday the 22nd. After four grueling hours of intense effort, Dr Wyma stitched me up and the surgery was complete. He had listened to our band, Crimson House, throughout the surgery, to, as he put it - “keep my soul in the room.” It had worked. The surgery was extensive. I needed several steel alignment plates inserted, and my jaw re-aligned. Fragments of bone needed to be removed, and my destroyed sinus seen to as much as possible; as was the nerve damage incurred from the strike. I was lucky to have a skilled surgeon, and seemingly the operation has been successful - however I will need to go for several check-ups in the coming days. I am putting all my energy into healing; to be ready to play an amazing set at Mercury Live in Cape Town on the 1st of December. Fortunately, the Namibian Police recovered much of the production company’s filming equipment - and seemingly impossibly, the footage of our acoustic sessions was still on the SD cards. The almost-lost acoustic sessions will be available soon. Sadly, my medical bills thus far have exceeded R20 000, and I have lost a lot of income (almost R100 000) in the shows I have had to cancel as a result of this attack. A vocalist who cannot use his mouth and face is in trouble. This is a busy season for musicians, and our season in Cape Town is a short one. There is nothing that hurts me more than cancelling my shows, although the agony in my face has come close. Every cancellation thus far has had me in tears, all I have ever wanted is to make music, and these violent men had tried their best to stop me from ever doing it again. My medical Aid has fortunately covered some basic medical costs, but much is uncovered and this is why I write to you today. On that fateful Friday afternoon, I almost lost my life - I almost lost my friends. They suffered, and suffered more when they thought they might have lost me. We are alive - thanks to each other. The universe, and some bad, bad men - brought me to a stop with a thud; and maybe it was time for me to slow down, and appreciate the fortune I had accumulated around me. The fortune became all too clear as I felt the outpouring of love towards me. Though this has been an incredibly dark time, the support and love I have received from so many people is a flame burning bright - showing me my direction. Right now I need financial help, and emotional help - as I recover from this experience; but I have never been so aware of the incredible people and communities which surround me; envelop me with their love - I have never been so grateful. So, this album is being made available for you to buy. I do not want hand-outs and charity, but I cannot deny that without you; I will not be able to rise from these ashes. So please, buy this album for what you think it is worth. All of the songs were written in my youth. A dark time in itself; and a time in which I was both finding myself as a person, and as a musician. For a long time, I have been hesitant, almost too embarrassed; to release these songs. And this attack has made me realize why. The songs made me feel vulnerable, powerless - just as those violent men had. They made me a child again. And that is not a bad thing. I hope these songs bring you peace, I hope they bring you power. This is my crowdfunding campaign, instead of you just giving me cash, I want to exchange a vulnerable piece of my soul. 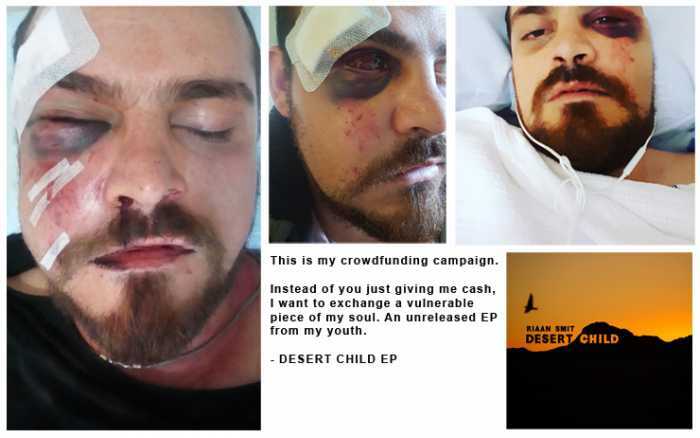 For those who contribute to my cause, you will be given an opportunity to download my hidden EP, Desert Child. I thank you all, from the deepest part of my heart; for your unconditional support and love. I am rich beyond my wildest dreams, in you - the people who have come in and formed a loving, protective mesh around me. I hope to make you dance and sing and laugh for many, many years.